The PD tour combines camping in olive groves as you paddle north along the mainland coast with nights spent at traditional old stone guesthouses in small villages on the islands. You travel further afield than our classic Elafiti Island Hopping tour, north to the Pelješac Peninsula, famous for its wineries and as Dubrovnik's northernmost defensive frontier, and to several uninhabited islands in the Elafiti archipelago. Highlights include six days of paddling and overnights at campgrounds and in villages without many tourists. Meals are in family owned restaurants in small villages and packed picnics in more remote areas. The kayaking is moderately challenging and invigorating, but not overly demanding. We move at our own pace, enjoying the crystal clear Adriatic Sea. We also swim, snorkel, cliff jump, and hike along old goat trails to hilltop fortresses. 2019 Departure Dates: May: 12, 26 / Sep: 27. Custom tour dates upon request for groups of 4 or more. 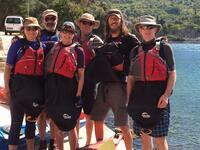 Paddle Dalmatia is an expedition style tour, a way to get to know the whole Dubrovnik region by kayak. We begin by paddling north from Zaton Bay, a beautiful narrow bay two kilometers long just outside of Dubrovnik, to Ston, the border of the old Dubrovnik Republic. Ston was built as a fortress town to defend Dubrovnik from northern invaders. Ston is famous for its well preserved 15th-century defensive walls, the longest in Europe, and salt mines, as well as its delicious mussels and oysters. 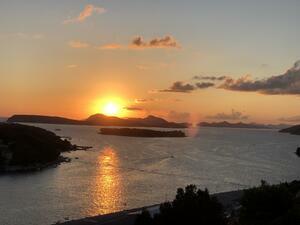 On the way, we travel along the mainland coast that was once the path of ancient Roman travelers. From Ston, we paddle south, leaving the mainland coast for the outer uninhabited Elaﬁti Islands of Olipa, Tajan, and Jakljan, to Šipan, the largest and most remote of the three inhabited Elaﬁti islands. Šipan has two villages, Suđurađ to the east (closer to Dubrovnik) and Luka Šipanska to the west. The furthe st out of the inhabited islands in the Elaﬁti group, Šipan is the least visited by tourists. From Šipan we paddle to Lopud, the middle island of the Elaﬁti chain. Without roads or cars, Lopud is a charming village of just 200 people. Inhabited from ancient times, Lopud has acquired an interesting combination of old stone houses, palm tree parks, old gorgeous mansions surrounded by orchards of colorful lemon, orange, and kiwi trees. Our last stop before we return to Zaton is Koločep, the closest Elaﬁti island to Dubrovnik, where we paddle along dramatic cliffs and caves on the outer open-sea side. While we pack and carry all our gear in our kayaks for the whole tour, we lighten our load after day 3, when we move from tented camping to more luxurious private guesthouse accommodations. We eat fresh and organic delicacies at cozy restaurants and guesthouses. Finally, we are constantly charmed and mesmerized by the old customs and relaxed island lifestyle as well as the rich Mediterranean ﬂora and fauna present in this beautiful area of Croatia.